Gingerbread Rooibos from Market Spice. . . . I was a little nervous about this one. Like I’ve said before, I don’t usually like ginger. So I definitely approached this blend with trepidation. I wasn’t sure if it would be too spicy, like ginger sometimes is. I also don’t usually like rooibos, it sometimes has too much of a woodsy taste, too earthy. My hopes for this tea was more of a gingerbread cookie with icing. My wish was granted! Once steeped, this blend smells like I am baking gingerbread cookies and mixing vanilla icing in my kitchen! I was so happy because the rooibos is basically undetectable. Its super smooth and sweet with a hint of cookie. The ginger is less spicy and more sweet, like the kind of ginger you taste in gingerbread cookies. I did add agave which definitely cut the spiciness and added some sweetness, but this blend definitely was reminiscent of cookies regardless. I finished my cup in less than 5 minutes that’s how delicious this was. It was smooth and reminded me of those little gingerbread man cookies covered in vanilla icing. I actually love this blend so much that I wish it was caffeinated so that I could have it in the mornings. If it had caffeine I think it would be one of my favorites, especially in the fall/winter. I would really recommend trying this even if you don’t generally like rooibos because it definitely wasn’t a typical rooibos tea. Very yummy! This was the first blend I tried from Market Spice, but I will definitely be trying more in the future! This tea doesn’t appear to be available now but click below for rooibos blends that are. Caffeine Free caffeine free dessert tea Dessert Tea flavored gingerbread tea flavored rooibos blend gingerbread tea Market Spice Rooibos rooibos blend Tea tea blog Tea ReviewLeave a Comment on Gingerbread Rooibos from Market Spice. . . .
An original blend of our Earl Grey Tea with Rose Petals and Lavender flowers. An excellent after dinner tea! I know, I know … I’ve said it at least a hundred times before, and I’ll probably say it another hundred (or more) times. I love Earl Grey teas. Well, most of them, anyway. I have actually come across a few – maybe a handful or more – of Earl Grey teas that weren’t worthy of the praise I usually lavish on the bergamot tea. And I also adore most of the variations on the Earl Grey concept: bergamot teas that are just a little different from the classic Earl Grey. This is another twist on that classic favorite: Princess Grey Tea from MarketSpice. This tea took the bergamot black tea and added rose petals and lavender buds. I like it! This Princess Grey offers a softer bergamot flavor, reminding me just a bit of the softer flavor you might experience with an Earl Grey creme but without the vanilla overtones. The bergamot here isn’t edgy or bold or in your face, it’s a gentle citrus-y presence that mingles well with a subtle lavender undertone and hints of rose in the distance. Normally, I prefer a stronger bergamot flavor, but, I like this softer presentation. I think that a softer bergamot flavor works best with teas where there is a lavender or other assertive floral flavor (the blue cornflowers are not included in this statement as these are added primarily for a touch of color to the blend, not because they offer a strong flavor profile to the cup). I believe that a stronger bergamot note might have made this come off as perfume-ish and nobody (at least, nobody that I know of!) wants to drink a cup full of perfume! This tea offers a nice balance between bergamot and floral notes: there is contrast between the flavors without too much competition. As it is, the floral notes are pleasant and accent the bergamot well. The black tea is a what I’d call a moderately mild tea, it doesn’t become too assertive in this blend, but it is strong enough to stand up and be tasted behind the flavors of citrus and flower. A really enjoyable cuppa – I’m glad I had this opportunity to try yet another Earl Grey variation! It’s one of the joys of this “job” … and one I can’t imagine of which I’ll ever tire! Our signature MarketSpice cinnamon-orange tea in a 4oz glass jar. This unique spicy, naturally sweet flavor has become world famous, originating in the historic Pike Place Market in Seattle. We recommend storing this glass jar in the refrigerator to keep the flavorings fresh and moist. Ingredients: Black tea, cinnamon and orange flavorings and spices. Contains no sugar. There are a lot of cinnamon-orange teas out there, but really, it doesn’t get any better than this. 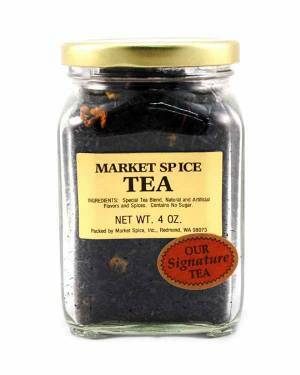 I tried MarketSpice Tea several years ago when a friend from Seattle sent me some. I fell in love with it. Since that time, I’ve tried many cinnamon-orange teas, but all have fallen shy of the mark – that high standard that this tea set for me. When it comes to this tea, most people either love it or hate it. I guess it’s pretty obvious which side of the spectrum I’m on, right? And honestly, when I get analytical about this tea, I really shouldn’t like it. But I do. Somehow, this tea is just… fantastic. But I really shouldn’t like it. It is very strongly flavored. So strongly flavored, in fact, that when I first opened my pouch, I could see the moisture on the leaves from the flavoring. The spicy-hot cinnamon here nearly overpowers everything else. That being said, I still love it. It’s like liquefied red hot candies with a splash of orange. This tea makes me giddy with excitement and brings out the kid in me. As I said before, it just doesn’t get any better than this.